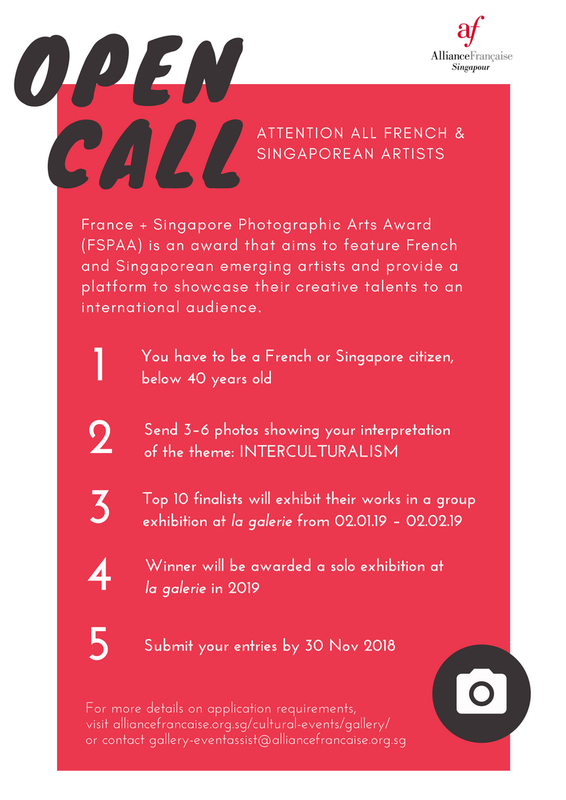 This year, Alliance Française de Singapour is holding their 9th France + Singapore Photographic Arts Awards (FSPAA), a photography competition that aims to feature French and Singaporean professional artists. Providing a platform to showcase their creative talents to an international audience, this competition promotes the exchange of artistic knowledge, experiences, and ideas between the artists from France and Singapore. The top 10 finalists of the competition will get to exhibit their works in a group exhibition in la galerie, from 2nd January 2019 to 2nd February 2019. The FINAL WINNER will be invited to do a solo exhibition in la galerie in 2019. To participate, the artists must send us their applications before the deadline, 30th November 2018. The artists should have a French or Singaporean citizenship (including PR) to be eligible, although they don't have to necessarily be based in either France or Singapore.